Your humble author engaged in the fury of the catch. Californians are pretty lucky. We have amazing weather almost year round, unbeatable street tacos and the massive expanse of the Pacific Ocean to play in. From surfing and kayaking to beachcombing and cliff diving, the big blue Pacific is the perfect playground for any age. However, on this particular Labor Day Weekend, our sights were set on fishing off the coast of San Diego. It was a cool and breezy morning as we headed out on the Point Loma Charter Boat, just one of many charters available in that area. The bacon and eggs for the breakfast burritos were already on the grill as the boat headed out to pick up sardines on the bait barge. "Those damn seagulls are pretty brave!" I said as one dive-bombed the bait net between scoops. Before I go any further, I need to introduce my partner in crime on this adventure. Brian has been one of my best buds for over 35 years. He is the Dr. Gonzo to my Hunter S. Thompson, the Ted to my Bill, and we are exceptionally gifted at finding (and consequently getting out of) some serious trouble. In our younger days, we would completely cover friend’s houses with the dumpster day-old Bagels of a local bakery. As we got older we would hit up beach bonfires with our guitars and as the night raged on and the fireworks came out…um…actually, let's get back to the story. 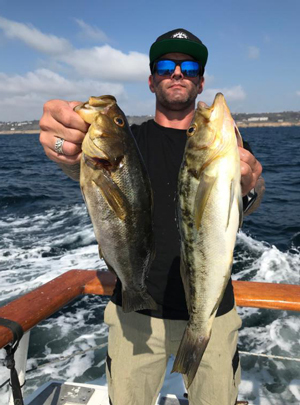 Yes, this is Brian with his Calico Bass bounty. Back on the boat, the breakfast burritos were devoured, the hooks were baited and the Captain let us know that we were hovering over some kelp patties at about 200 feet down. My weapon of destruction that day was a medium action Calstar rod and a Shimano Torium 14 conventional reel, which was perfect for the dense kelp. As I cast out, being careful not to stun my bait, I waited for that beautiful moment where the line tugs and the inevitable strike occurs. And I waited…and waited…and switched to a new bait…and waited some more. However, to my right was my buddy Brian—remember him from the bagel story—he had his first hookup. Then his second and then his third! 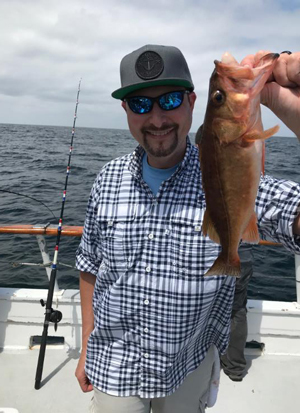 Each Rockfish or Calico Bass seemed to be larger than the previous. Our trusty deckhands helped tag them and bag them, as these suckers were definitely keepers. Suddenly I felt that line twitch and I reeled quickly about three turns to set the hook. My rod bent down with a vengeance. The fight was on as I adjusted my drag for the monster that was doing his best to defeat me. Like The Old Man and the Sea, I fought, determined to land this Leviathan, and be the envy of the charter! For what seemed like an eternity, the endless battle between beast and man took place. I called over a deckhand, as I was certain I would need a net, gaff hook and assistance getting this Kraken on board. My fish was 12.5 inches. Legal but not the monster I had anticipated! When the monster emerged I was shocked and amazed. The deckhand immediately grabbed the fish off my hook and proclaimed "Yeah, it's big enough, but just barely." We all had a good chuckle when I proudly held up the little guy for the boat to see. Luckily for us all, as the day went on the fishing vastly improved. 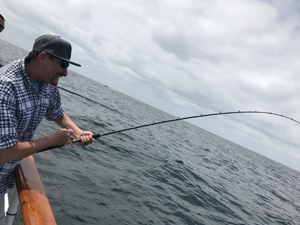 Switching back and forth between live bait and frozen squid, we caught fish after fish as the captain expertly navigated the kelp beds off San Onofre. There were double and triple hookups, and every angler on the boat caught at least a few Rockfish. When the day was done, Brian had maxed out, and I had caught more than enough for a killer fish taco dinner! While heading in after an amazing day on the water, our deckhands graciously filleted and bagged our catch. We settled our galley and bar tab and tipped out the fantastic help—ALWAYS tip your deckhands well. The charter boat experience was absolutely amazing. With top-notch service and a lifetime of local experience, these crews go out nearly every single day with the SOLE purpose of helping YOU have a great time fishing. The Captain and deckhands are patient and attentive no matter what skill level you are. It was pretty incredible watching the kids catch fish larger than their head, and seeing their eyes light up when someone immortalizes the experience by posting it on social media for their family onshore to see. Back on land, we sat in Labor Day traffic on U.S. Highway 5 heading back up to Dana Point and were pretty quiet, as the full day of sun and sea leaves you exhausted and fulfilled at the same time. After some tacos and a few cold local IPA's, the stories became exaggerated and the fish became even larger (except for my first catch of course, which apparently shrank). 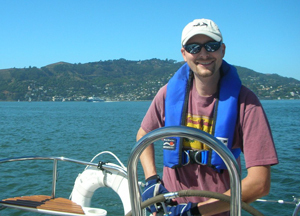 As an angler, sailor and lifelong water activity enthusiast, Galen brings over 20 years of Marine Retail experience to the eCommerce team at West Marine. 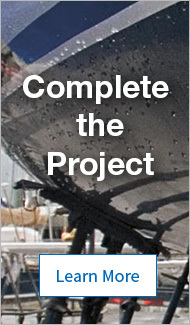 Over the last two decades, Galen has supported retail marine stores in New York, Northern California, The Pacific Northwest, Southern California and currently keeps quite busy as an eCommerce merchant for marine electronics, fishing, paddle and core products. During his college years at University of California Santa Barbara (go Gauchos! ), Galen lived aboard a 1964 Columbia 26' and earned his ASA Certifications. Currently residing in Santa Cruz, CA, Galen lives with his wonderful wife, two insane cats and amazing dog, Lucy.